BIBD today feted its second monthly winners of its “Swipe to Fly” promotion at the recently refurbished BIBD Manggis Branch. All the winners were seen excited with smiles when arriving at the branch to collect their prizes of a pair of air tickets to Bali. Present to hand over the prizes was BIBD Manggis Branch Manager, Hjh Raidahwati bti Hj Abd Rahman. The BIBD “Swipe to Fly” promotion continues until the 31st of March 2015 with five pairs of air tickets up to Dubai and Melbourne still up for grabs. Let BIBD reward you by sending you and a partner on your dream holiday. All you need to do is use either your BIBD cards or BIBD eTunai service and spend a minimum of B$30 on a single receipt at any retail or online outlet. This will entitle you to receive an entry into the monthly “Swipe to Fly” lucky draw. What’s more, BIBD customers will be rewarded with an additional ten bonus lucky draw entries for accumulating a monthly minimum spending of B$1,000 on their BIBD Cards and eTunai for that month’s lucky draw. Winning has never been easier as there are no hassles of filling entry forms for each qualifying purchase transaction, making that dream holiday one step easier and closer. 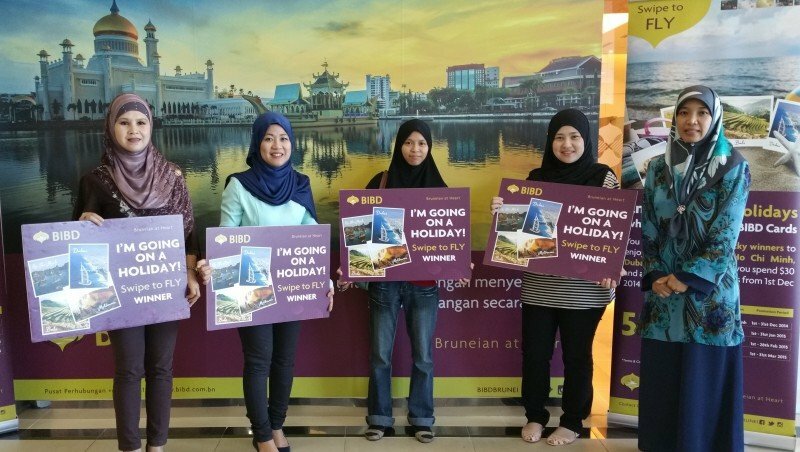 For more information on any BIBD products, services or promotions, please follow the BIBD Instagram account at BIBDBRUNEI; Facebook page at www.facebook.com/bibdbrunei; get in touch with BIBD Contact Centre at 2238181 or visit the nearest BIBD Branch. Also, don’t forget to download the popular BIBD Mobile App to get the latest BIBD offers and promotions under “What’s New” feature.